An abandoned building that formerly housed the Nurses Hostel in New Amsterdam was Saturday afternoon destroyed by fire. 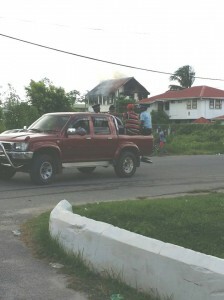 Divisional Commander, Senior Superintendent of Police, Ian Amsterdam said investigators were working on the theory that vagrants ,who frequent the building, might have been responsible for the blaze. There were no reports of injury. No one has been arrested. In the past, several fires in Georgetown have been attributed to vagrants. Fourteen companies in June, 2016 submitted bids to construct a new nurses hostel in the compound of the New Amsterdam School of Nursing. The engineer’s estimate was GYD$60.1 million.